Viva Safaris tourists regularly request advice as to which destination, Tremisana Lodge or Marc’s Treehouse Lodge, they should book a safari. We are often asked why there is a significant difference in tariffs. Guests at Marc’s Treehouse Lodge are adventurous and young at heart. They are prepared to forfeit certain luxuries in the pursuit of a real African bush experience. They certainly are not afraid of frogs and spiders. The Treehouse Lodge is unique and caters for tourists of very differing financial means. 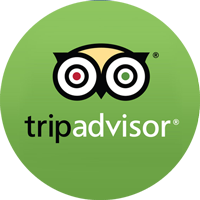 Guests at Tremisana are generally more mature and are accustomed to simple luxuries. Of course they are still in the bush and may also encounter frogs and spiders, but these are unlikely to be in the chalets. Guests at Tremisana appreciate the compactness of the camp as well as the easy accessibility of all features and amenities. Tremisana is electrically fenced as elephant are common. On the other hand, the animals at Marc’s are free to move throughout the camp. Nyala and buffalo are often seen grazing below the treehouses. Accommodation is very different. The treehouses at Marc’s Treehouse Lodge are made of canvas and reed walls as opposed to the conventional brick and mortar walls at Tremisana. As a result there is reduced climate control in the treehouses. If it is cold and windy, then the reed walls offer limited protection. Tremisana chalets all have air conditioning, so that in the very hot summer months between October and March, the chalets are pleasantly comfortable. Air conditioning also has another advantage mosquitoes do not like cold air, so once the air conditioner is switched on, the mosquitoes along with all other insects, disappear. 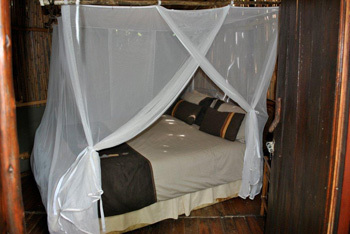 Our clients tell us that the fans and mosquito nets in the treehouses are just as effective. The treehouses are not completely insect-proof or even frog- proof insofar as there are small gaps between the reeds and the thatched roofs, but this adds to the adventure ! In the Tremisana chalets, there are no gaps between walls and roofs. The doors have rubber at their bases to keep out insects and other creepy-crawlies. The windows of the chalets are burglar-proofed and are covered by insect-proof screens whereas the windows of the treehouses have a roll-up canvas cover. There are other differences : The Tremisana chalets have a tea/coffee station. Tremisana chalets are supplied with shampoos and insect repellant and have mats over the tiled floors. 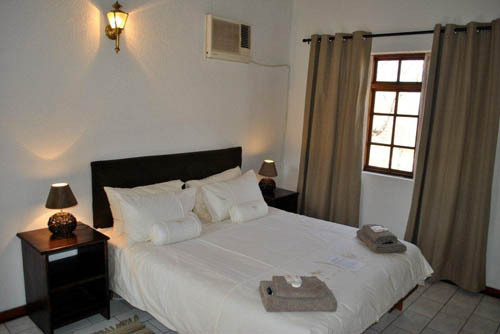 The finishes at Tremisana are generally better and the beds are more comfortable. All the chalets at Tremisana have en suite ablutions. Three of the twelve treehouses ( the original treehouses ) at Marc’s have private, but not en suite, ablutions, as do the seven tents. This means that people booking a safari to Marc’s Treehouse Lodge cannot be guaranteed en suite facilities, but will probably enjoy showering under the stars ! Tremisana has a better wildlife prestige status insofar as it is Big Five. It is part of Kruger Park as there are no fences to Kruger, whereas Marc’s is in a Big Three ( Rhino; Buffalo and Leopard ) enclosed reserve. Marc’s Treehouse Lodge has a better “ bush ” feel about it, whereas the manicured gardens at Tremisana lend a different dimension to the experience. Perhaps the most important difference is in terms of activities. At Tremisana there is an additional game drive, the “Sunrise ” morning drive. The 4h bush walk is only offered to clients doing all our 4, 5 and 6 day safaris. 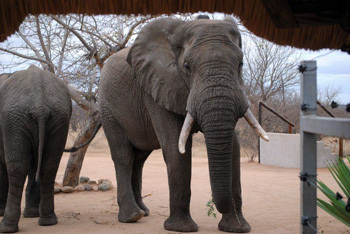 This appeals to guests who appreciate the opportunity of encountering lion and elephant on foot. All Tremisana safaris also include a 3h Game Drive at the Big Five Tshukudu Game Reserve which is always very productive in terms of Big Five sightings. Guests on the 5 day and 6 day Lodge/Treehouse and Lodge/Tent safaris also go to Tshukudu. Viva Safaris believe that both our lodges offer exceptional value for money. When compared to other operators, we are convinced that all of our safari experiences offer way better wildlife experiences. Budget-conscious backpackers should be encouraged to book Lodge/Tent safaris. Adventure-minded tourists who are seeking a real African bush experience should be encouraged to book Lodge/Treehouse safaris. 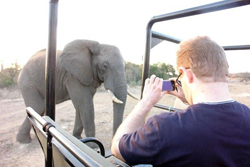 Tourists looking for Big Five lodge accommodation and who enjoy a little pampering both in terms of game-viewing activities and relatively upmarket facilities should be encouraged to book safaris at Tremisana Game Lodge. Unless they request otherwise, all Fly-In safaris are accommodated at Tremisana Lodge.